Day 1:Upon arrival in Maun we depart by road to Deception Valley Lodge. Deception Valley Lodge is located approximately 90 km (55 miles) from Deception Pan bordering the Central Kalahari Game Reserve. The lodge accommodates 16 guests in private chalets, each with a spacious lounge, en-suite Victorian-style bathroom, outdoor shower and veranda. The main area, connected to the units by elevated wooden walkways, boasts dining, lounge and bar areas. From the deck wildlife can be seen at the nearby waterhole and there is a curio shop, small library, swimming pool and boma for evening meals. A cultural highlight here is fascinating interaction, through an interpreter, with San Bushmen who will explain their traditions, hunting methods and natural medicines. Added to this is a short game drive enroute to the nature walk with an experienced Bushman guide. We also enjoy a night drive on the reserve. After an early breakfast, we depart overland to our private Adventurer campsite in the Central Kalahari Game Reserve with lunch en route. Deception Valley – a prehistoric riverbed, flanked by petrified dune lands – is very appealing after brief rains, when it is covered with nutritious grasses that attract vast animal herds from all over the enormous reserve. These large congregations of desert wildlife with their young are followed by opportunistic predators (including populations of lion, cheetah, black backed jackal, bat eared fox and African Wild cat), all of which makes for outstanding viewing. The rare and seldom seen brown hyena is also sighted from time to time! Bird life is prolific, with over 400 species in the region. 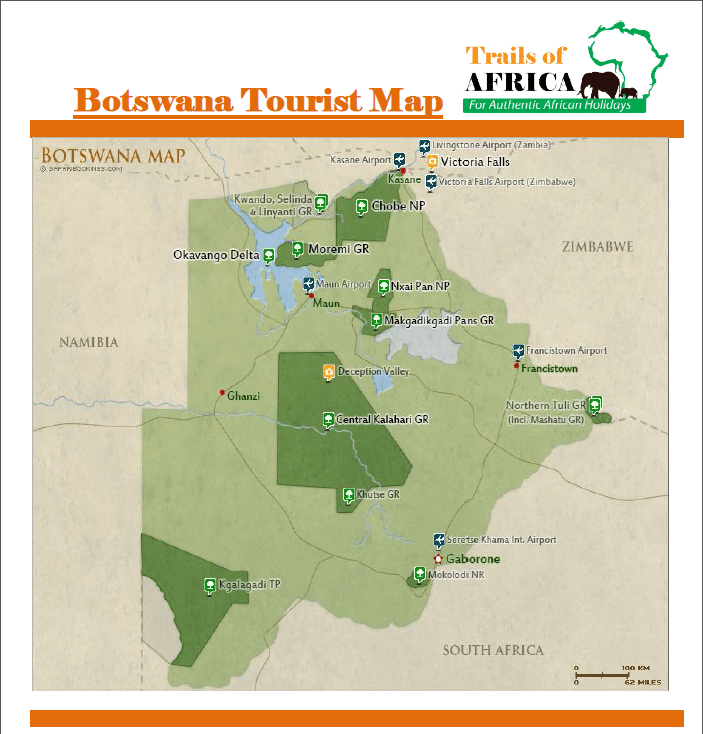 We have specifically allowed for a 3-night stay in Deception Valley; in a journey of this nature and at this time, it is vital to travel on guests have the time to relax and unwind, at the same time extended day trips, which affords the opportunity to explore the further reaches of the park not normally accessed and ensuring the best possible wildlife experience. We enjoy extended wildlife game drives (with picnic lunch), taking in the game-rich Pipers Pans area of the Kalahari, as well as the Letiahau and Deception Valleys. After a light breakfast we depart overland to Maun (approximately 6 hours), after which we fly by light aircraft in the afternoon to the water-filled paradise of the private Xigera area, within the Moremi Game Reserve. Xigera is the Delta personified, with serene waters flowing through innumerable channels around remote islands and a profusion of plant and animal life. Xigera Camp is a luxury tented camp situated in the heart of the Okavango Delta. It has something for everyone, in an area where there are no other camps and where year-round water allows for a variety of activities. Enjoy a true Delta experience while you sit back in a mokoro (dugout canoe) and silently glide through the tranquil Okavango waterways or watch the sunset and birds gliding home to roost from a motorboat on the Xigera Lagoon. Nestled in a soothing riverine forest, Xigera Camp consists of 10 luxuriously furnished tented rooms with en-suite facilities and outdoor shower. Each room is raised off the ground on a wooden deck offering superb views of the seasonal floodplain and waterhole. Meals and drinks are enjoyed under the thatch of the raised lounge, pub and dining area overlooking a permanently flowing channel. A traditional boma offers alternative dining under the African stars. Wooden walkways wind through the forest connecting the rooms to the main area. There is a plunge pool for cooling off and relaxation. The area has the highest density of the rare sitatunga antelope found anywhere in the Okavango Delta and wildlife is often seen on boating trips. Possibilities include spotted-necked otter, elephant, red lechwe and even leopard on occasion. Birding in the area is phenomenal, with Pel’s Fishing-Owl, Slaty Egret, Wattled Crane, Swamp Boubou, African Pygmy Goose and Chirping Cisticola some of the sought-after specials. Learn about the ecology of the Delta, find a painted reed frog – Xigera certainly offers a holistic experience of this wonderland. After a last early morning activity and breakfast, we fly back to Maun, where the safari ends and catch your flight back home.